Arsenal went to St James’ Park and put on a first half display that rivaled any performance you will see in the Premier League this season. Arsenal were slick, hard-working, clinical and ruthless. It was a masterclass from a team bang on form. But during that first half, there were worrying signs. Not from the players, but from Phil Dowd, the referee. Throughout the half Newcastle, incapable of playing with Arsenal, were permitted to have their little kicks at the away side with no repercussions. Joey Barton, the despicable scofflaw that he is, was consistently taking shots at Arsenal players. At one point he went recklessly and forcefully through the back of Andrey Arshavin. As he so often does, the little russian luckily bounced right off the ground with a smile. It was at least a yellow card offense, but Dowd amazingly failed to even consider it a foul on Barton. During the first half, Dowd did not issue a single card to a Newcastle player despite persistent fouling. For the match, Dowd called the same number of fouls on both teams and showed Arsenal one card more than Newcastle. He didn’t even show Newcastle a card until the 69th minute. Then came the key moment in the match. Joey Barton went flying into Abou Diaby with his feet raised off the ground, caught Diaby high on his ankle, and nearly delivered another crushing blow to the young Frenchman’s career. Diaby’s leg bowed sickeningly, but thankfully did not break. If Barton had been issued the card (or cards) he deserved earlier in the game, that “tackle” never would have happened. If Dowd blew for a foul on that play and rushed in to show Barton a card of any color, Diaby would not have lost his temper. But Dowd did nothing. There was no card, no foul, and no intervention. Despite obvious simmering tempers between Diaby and Barton, Dowd was not on hand to prevent what came next. With no one protecting the Arsenal players, and no one curtailing Barton’s reckless behavior, Diaby took matters into his own hands. He grabbed Barton by the neck and pushed him, which of course sent the “hard” man sprawling to the pitch. It could have been a yellow card. I saw a very similar incident in the Levante match in Spain handled with yellow cards. It would have been sensible under the circumstances. 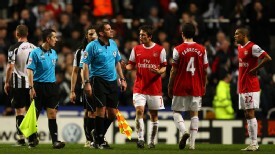 But despite keeping his cards (and his whistle) in his pocket all day, Dowd produced the red card for Diaby. If you find yourself saying it had to be a red card, consider that Kevin Nolan later grabbed Szczesny by the neck earning him only a yellow card. The incidents were similar but produced different decisions by Dowd. People were calling it an appallingly stupid reaction and blame Diaby for losing his composure. I am not among that group. While Diaby’s reaction was detrimental to the team, it was both understandable and unavoidable. Allow me to explain my position. Thomas Hobbes’ wrote a book called Leviathan. In it, he details a state of nature where people kill each other and steal each others’ possessions. In civilized society people do not commit these acts because of the fear of a “second strike.” Law enforcement serves as a deterrent because we know that if we commit a criminal act, and we are caught, we will be punished. That punishment is the “second strike.” If I punch you in the face, I know that the police will punish me. But if I keep punching you in the face, and I am not punished, eventually you will have to take matters into your own hands. And you might choose to protect yourself by shooting me. This kind of thing happens on the football pitch all the time. When a referee takes control over a game in the proper way, players mostly behave properly for fear of bookings and subsequent dismissals and bans. But when one team is allowed to kick another team all day long, and commit potentially career threatening challenges without repercussions, then the abused players have no choice but to stand up for themselves. When you consider that Abou Diaby has been the victim of one of the most heinous challenges I have ever seen on a football pitch, and that the consequences of that challenge have blighted his career, it’s no wonder he’s particularly sensitive to violent play. Phil Dowd should have taken control of the football match from the start and he didn’t. He should have shown Barton a card earlier in the match. Had he done that, the Diaby incident wouldn’t have happened. Dowd should have shown Barton a card for his second-half challenge on Diaby. Had he done that, Diaby would have felt justice had been done, and likely not reacted. But Dowd did nothing to protect Arsenal players. Dowd did nothing to punish Barton’s reckless, violent play. And subsequently the responsibility fell to Diaby. Dowd could have taken those factors into consideration before booking Diaby, but on that day, Phil Dowd was determined to teach Arsenal a lesson about foreigners criticizing English referees. From that moment Arsenal looked shaky. Not only were we down to ten men, but we were down to one competent center-half. The red card also served to invigorate the Newcastle team and the home crowd, both of which had previously quit on the match. If Phil Dowd walked off the pitch at that moment, he would have done enough wrong to cover three or four matches, but his worst was yet to come. The penalty he called on Koscielny was soft. I heard people say the phrase, “you see those given all the time.” I would suggest that you see those not given all the time. If the name on the back of the number 6 shirt was Ferdinand or Terry, that’s not a penalty. Koscielny jockeyed for position with a player who had his back to goal. The player went down easily, and while Dowd had an excuse to call a penalty, that doesn’t mean that he should have called a penalty. Not exactly the kind of professional and impartial attitude you’d expect from a man who is supposed to be an unbiased arbiter of professional football. And while the penalty calls and the red card are the obvious moments to discuss, Dowd put his stamp on Newcastle’s comeback with a variety of awful foul calls, one of which lead to the free kick that ultimately produced the equalizer. When I look at the Newcastle game, and I look at the standard of refereeing, and I look at the effort put in by the Arsenal players, I simply can’t blame them for the collapse. I can’t blame a team that looked magnificent in building a 4-0 lead. I can’t blame players that gave so much to the game that they looked absolutely shattered on 70 minutes. And I can’t even blame them for giving away the lead when two of the goals were gifts & the red card was a travesty. But unfortunately I think I have to take a moment and deliver some criticism to Arsene Wenger. I am a huge Wenger supporter. I believe he should be at Arsenal and has done more for Arsenal than most people can contemplate. We should praise him for all that he has done and continues to do. Arsene Wenger has a built this magnificent team and it can be one of the best in Europe. But he’s not infallible and I think he’s culpable in the Newcastle result. Arsenal started that game without a single bench player who could reasonably be expected to do a job as a holding midfielder. Alex Song is essentially the only legitimate, fit defensive midfielder at Arsenal and without him in the side, and with our pseudo-DM Denilson also out of the squad, there was no one to back-up Diaby. Once we went down to 10 men, the team was overrun in midfield. Yet Arsene Wenger didn’t make a change for 19 minutes. With Squillaci replacing Djourou in defense we were always going to look a little vulnerable, but in front of the back four we had Wilshere, Cesc, Arshavin, Theo and RVP. How is that group going to provide any protection for their defense? I think the answer is simple. They’re not. And they didn’t. When the game went to 4-1 thanks to Phil Dowd, we still only had to survive another 20 minutes. But the only change Wenger could really make was to bring on the badly out-of-form Rosicky for Arshavin. That’s the move our manager made to sure up the defense at a time when we looked like we were reeling and just needed to see out a result with a 3 goal lead. Think about that. We didn’t have a single defensive minded midfielder we could bring into the game. He might have considered bringing in Eboue before Rosicky, but he didn’t make that move. Eboue came on in the 79th minute after Newcastle’s second. Rosicky’s introduction turned the game in many ways. He was the wrong man for the moment and he was absolutely diabolical in his twenty minutes. I feel sorry for him because I’m not sure that he could have helped the situation in his best form. But in his current form he was gasoline on the fire. I’d like to say that Rosicky was a bad choice by Wenger, but the manager really left himself very few choices with the players he had on the bench. I also found it fascinating that while Newcastle were delivering cross after cross and free-kick after free-kick into our penalty area, Wenger never introduced Bendtner or Chamakh. Instead he stuck with the clearly tiring Van Persie for 90 minutes and Walcott for 79. With Djourou replaced by Squillaci and Diaby off the pitch, we started losing every contest in the air. The manager could have countered that by introducing one of our towering strikers. Arsene Wenger will forget more about football while he’s sitting on the toilet today than I will ever know, but I genuinely believe that if he brought on Chamakh for Arshavin and Bendtner for RVP, we probably would’ve done enough to salvage a win. Then there’s the issue of center-half. After the transfer window slammed shut, I wrote on twitter that I support Arsene Wenger. And I still do. Strongly. But the situation that has developed at CB is beyond ridiculous. Let me be clear about one thing: there isn’t a club in England that has a great fourth-choice CB. Sebastien Squillaci is certainly qualified to be our fourth-choice CB. But he’s NOT our fourth-choice, he’s now our STARTING CB. And our backup for him is Alex Song, who is our only legitimate DM at the club. At Newcastle we couldn’t protect a 4 goal lead with 21 minutes to play not only because we had to introduce an inferior CB, but because we had no choice but to play with 5 attack-minded players in front of him. There’s a lot of people that think we should have bought a center-half during the January transfer window. I am among them. Vermaelen cannot be expected to contribute this season. He may well give us something, but depending on that is reckless. Johan Djourou is just back from a one-year injury layoff and Wenger himself has stated many times that when you come back from something like that there are always going to be little injuries along the way. Squillaci can be a competent emergency CB but he can’t be the guy you plan on playing in the big games. He can’t go up against Barca. He can’t start in the Carling Cup final. But by failing to sign a CB in January, that’s the risk Wenger took. He gambled on Djourou staying fit and Vermaelen coming back and, at least at the moment, it looks as though he lost. Wenger didn’t want five CBs at the club. That’s why he didn’t buy one. I’m not guessing at that, I’m taking it from what the boss said. So here’s a brilliant question: WHY NOT? Why didn’t he want five CBs. He suggests that you can’t pay a good player to sit on the bench. Nonsense. Of course you can. If Squillaci doesn’t like being paid to train and not play, he can cry himself home from Colney in his 7 series BMW. The club doesn’t exist to keep every player happy. The players are brought into the club to help the club win trophies. And sometimes you help the club win trophies by just being a backup plan. I read someone say on twitter today that buying a player doesn’t ensure you win the title, and not buying a player doesn’t ensure you don’t with the title. What a load of self-indulgent crap. By that argument, you shouldn’t buy any players. Or even have professionals at all. After all, playing with eleven sunday league players, doesn’t ensure you don’t win the title! Ridiculous. Having good players at key positions is how you win titles. Of course it doesn’t guarantee you anything. That’s just being argumentative for the sake of it. If Wenger had bought a CB in January who was better than Squillaci, would that guarantee us better results? Of course not. Nothing guarantees anything. But would it give us a better chance to win games? Yes. Would it have given us a better chance to hold on to a 4 goal lead at Newcastle? Yes. Here’s my personal belief, Wenger didn’t need to buy a CB … IF he bought a DM. If Arsene Wenger went out and bought a proper defensive midfielder to back up Alex Song, then having Alex Song as an insurance policy at center-half wouldn’t be so bad. We’d have two quality defensive midfielders, we’d have Diaby and Denilson who can somewhat play the holding role, and we’d have another backup for our depleted central defense. An extra quality DM at the club would solve a problem in two areas. And on Saturday it would’ve saved us the game. But Wenger didn’t buy anyone in January, and if defensive frailties ultimately see us crash out of the Champions League, or the FA Cup, or fail to win the Carling Cup or Premier League, then he’s going to have to look at his decision and question whether that’s what cost him some much desired silverware. Saturday’s result at Newcastle was sickening. It was horrifying. And it was down to awful refereeing and some questionable work by the manager. But the player’s should hold their heads high. They went into a difficult away ground and played the home side off the pitch. They fought hard when everything went against them and gave their all for the cause. And when it’s all said and done, their efforts at St James’ Park saw them gain ground on Manchester United in the title race. All four trophies are still there for them to win. Let’s just hope there’s enough defensive quality in the side to achieve something special this season. Hey ..great post. Where is the source of that Sagna comment. I certainly can’t seem to find any. If it is indeed true, it is shocking, Don’t you think referees have an obligation to respond to requests for explanation of their decisions ? Should Arsenal report him if its true ? Thanks! Got the quote from espn. I see your point. If I claimed not to be biased then I’d also be a liar. But I stand by what I wrote and how I saw events. Just on the point that Diaby had to react because Phil Dowd was offering him no protection, are you genuinely claiming that he shouldn’t have been sent off? Because by the implications of your own account of Hobbes, if Dowd doesn’t send Diaby off, Nolan and/or Barton would be okay to headbutt him, or something. Going on to the whole Hobbes thing, it doesn’t apply where there remain fundamental constraints. You’re right to observe that some referees probably do allow more kicking, fouling, and so on, than others, and also to observe that players temper their game accordingly. (The Chelsea-Liverpool game was an excellent example – by booking Mikel in the first minute, the ref ensured that nobody went diving in for the next seventy or so.) However, whatever and whoever the referee, you know that “violent conduct” and “serious foul play” are going to be red cards. However many niggly ones the ref’s passed up, if you headbutt someone, you’ll walk. There are three ways to respond to a foul that you think deserves a red card. You ignore it, you run squealing to the referee, or you retaliate. You have nobody but yourself to blame if you choose the stupid one. If Phil Dowd had decided not to send Diaby off, that would have been a worse decision that any of the others you’ve highlighted above. Even that weird second penalty (which other accounts attribute to the ref’s assistant). Or the Newcastle goal he wrongly disallowed, which I note you haven’t mentioned at all. Regardless, I see your points but this is an Arsenal blog after all and I’m always going to take a position that is inherently more biased towards the gunners. Having said that, I still stand by what I wrote and believe it’s inherently correct. As for the assertion that not sending off Diaby would be contrary to my entire argument, I think that’s slightly incorrect. Diaby could’ve been shown a yellow card and by the standard of review that Dowd had set within that game, it would’ve been consistent. But again, I have no problem with him sending off Diaby if his decisions were consistent, and he proved that not to be the case with his handling of nolan’s neck tackle on Szczesny. Good debate. And I appreciate you reading the blog!